Charles Godfrey Leland: a biography, in two volumes. Volume II, by Elizabeth Robins Pennell (his niece). ‪Houghton, Mifflin‬, and Company, 1906. 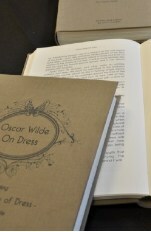 This latter reference to dress is an example of how Wilde was at this time was adding allusions to his subject matter that would eventually become a separate lecture (given in the UK and Ireland) and essay on the subject of Dress, a full history and exploration of which can be found in Oscar Wilde on Dress (John Cooper, CSM Press, 2013). 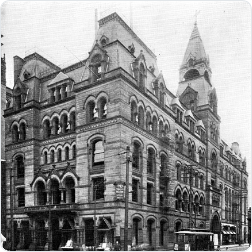 This second lecture in Philadelphia does not appear in the previous itineraries published by Mikhail, Ellmann or Page. It does appear in Beckson but with an incorrect venue. See Itinerary Comparison. The 'Association' in question was the Young Men's Christian Association (YMCA). 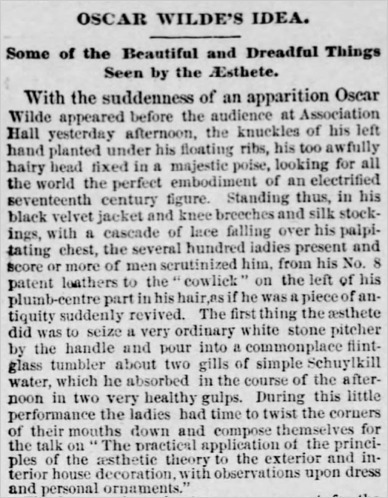 See also Wilde's lecture to the YMCA in New York. 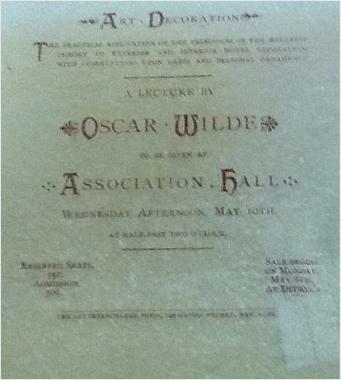 Essays and Lectures by Oscar Wilde, London: Methuen and Co., 1908, noted in reference to this lecture: "The earliest date on which it is known to have been given is May 11, 1882". As can be seen above this date is in error, and indeed had already been corrected in Mason as early as 1914 (below). In 1882 Walt Whitman was living in retirement in the city of Camden, a suburb of Philadelphia located across the Delaware River. 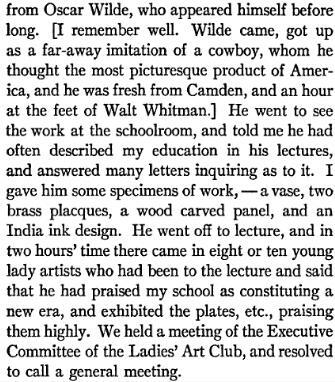 Wilde's meeting with Whitman on his first visit to Philadelphia on January 18th, one that lasted about two hours, is well documented. However, the contemporaneous journal entry by Leland (opposite) indicates that Wilde met Whitman again on May 10th. Leland's account is that Wilde, again lecturing in Philadelphia, had just returned from 'an hour at the feet' of Whitman. Indeed Wilde had written to Whitman while he was in Chicago on March 1, 1882, requesting a second visit with him.